There are words in today's culture which are banded around so freely to the point that they dissipate there meaning. What constituents 'greatness' in a public figure is one such example. Shallow stabs at 'celebrity' or 'fame' often bring with it the misguided penchant of 'greatness' when nothing could be further from the truth. Notoriety in itself does not warrant adulation, although sadly in today's inane culture it is often presented that a figure of public 'renown' must hold some special 'talent' which often proves to be shallow, facile and meaningless. But, within all this are those people who you can consider influential in your own life on a personal level, who from lack of recognition could easily slip through the fingers of time. There are two people in my own life within the drinks industry who I consider extraordinary ( in quite different ways) who were a major influence, and who should be remembered - and who I thank. My involvement with both wine and beer (in a non drinking capacity!) began at the age of 14 when I worked (after school) for W. H. Cullen Wines Merchants in Fulham Road, London. The manager was a Mr. Ivan Pascoe, a Bohemian but highly intelligent New Zealand gentleman who seemed to have an original and modern perspective on life, quite unlike other people of his generation! His approach in imparting his knowledge seemed novel and fascinating, with gentle encouragement, and never patronising. The more questions I would ask, and be supplied with the answers, the more the subjects of beer and wine begun to intrigue me, which fired my enthusiasm to learn more! Unlike many other adults he seemed to have time for your opinions - no matter how naive and unworldly they may have been at the time! I remember being fascinated to see a wine called Chateau Latour 1er Cru Classe from the 1967 vintage being sold for as much as £15 a bottle (an astronomic amount in 1973) in the shop. The vintage he informed me was a "poor one" but it was he Chateau's "reputation" that warranted the price. These contradictions fascinated me - and I wanted to know more! The second person who had a significant influence on my early career was James Rogers Managing Director of W. H. Cullen. I worked with James twice, firstly at Cullen's head office in Battersea, and later in my role as buyer designate for Andre Simon Wines off Regent Street, where James acted as consultant. Cullen's had an estate at that time of over 130 shops in the high streets of London and its environs, and were respected for their delicatessen foods and emerging wine range. 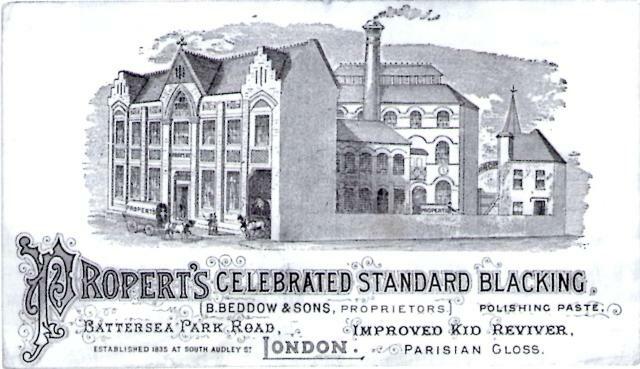 The building later to be the Head Office for W. H. Cullen at 142 Battersea Park Road was originally built for a completely different purpose, as the Propert's Blacking Factory. The building still stands today. 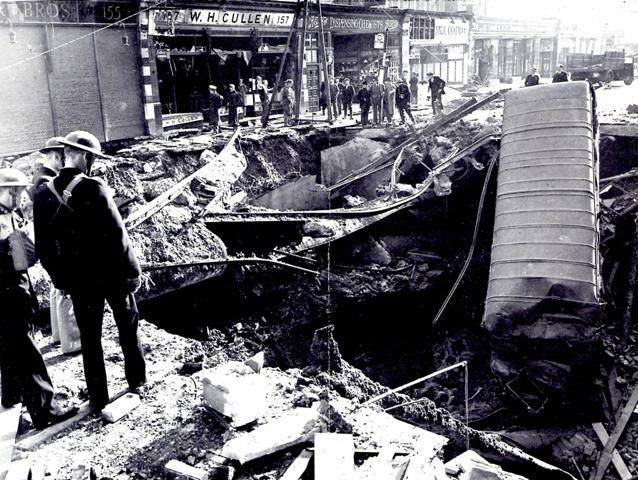 Terrible scenes from Balham during the Second World War which also shows a branch of W. H. Cullen's taking the brunt of the explosion. It was the period at Battersea which saw James extraordinary ability shine through. His enthusiasm for wine was well known, and with his effervescence of personality, infectious! But, what I admired about him at that time was that along with his original creativity and thinking was a willingness to push new boundaries. Some were controversial, but always done with a passion of self belief (which some saw mistakenly as arrogance) and with engaging humour! When Ideas did not quite turn out as he planned he had the humility to accept it and take responsibility, never blaming others. Cullen's have often been overlooked in terms of impact they had on the wine trade in the late 1970's and early 80's. They were the first to introduce wines from nearly every corner of the globe to British consumers, long before Oddbins 'pioneering' spirit. Not only that they were also pushing boundaries for Independent Regional Brewers also, with King & Barnes, Ruddles (brewed in Rutland!) Charles Wells, along with Samuel Smith's ( the only retailer in the South to be selling their entire bottled range at the time) to name a few. But it was James's tasting abilities which were also extraordinary. On one occasion I lined up fifteen wines of a single grape variety, Cabernet Sauvignon, which were all covered with hoods to be tasted 'blind' so it was impossible to know their origins . Each one came from a different country around the world, including some not normally associated with the grape at that time, such as Spain. James tasted very quickly darting up and down the line, and back and forth. Incredibly he named every single wine correctly, identifying the country from which it came from, and making no mistakes. I remember commenting in an astonished but understated manner with a lift in my voice "that was very good!" at which he then turned with a smile as if to say, he was surprised, but gratified by my comment, simply adding "thank you". Sadly, James left us far too early dying in1993 after a prolonged illness. To both of these people who played a part in my earlier life I am grateful. Hopefully their memories will be kept alive as people who warrant the term 'great' in the most genuine sense, and legitimate claimants of the term in its truest meaning.